1) From one of your previous answers you wrote the putter was 12 3/4" once assembled. Is that accurate? The putter is only 1 foot long? 2) Are they available iwth lefty and righty heads? Q:How long is the putter once assembled? A personalized hampton executive putter golf set is the perfect gift for your golf loving groom or groomsmen. 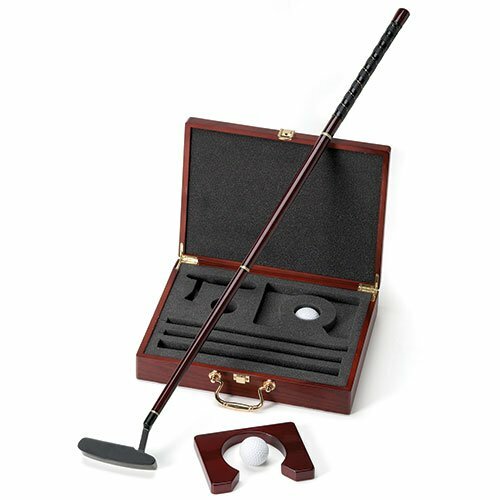 Find an included putter that disassembles for easy storage, a wooden practice cup, and two balls, all enclosed in a beautifully wooden case with a matching brass handle and personalized brass plate. This groom/groomsmen gift is a hole-in-one!